Some of you have reached out to me with the issue that their water has greenish shade. Now, there are just two things that can cause it, bacteria or copper. 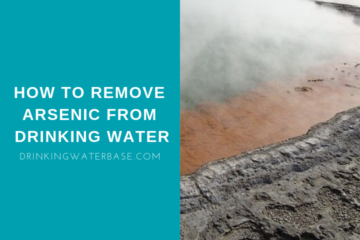 I will definitely get back to the bacteria in the future, but in today’s article, I will talk about how to remove copper from drinking water and everything that comes with it. In case, you don’t have time to read the article here is a short summary. Copper is a natural mineral that our body requires. However long-term exposure to an excessive amount could be dangerous. To remove copper, these methods are proven to be efficient – reverse osmosis, ion exchange, activated carbon and distillation. Does a Water Softener Remove Copper? Does Carbon Filter Remove Copper? Unlike lots of other contaminants that cause harm to your body, copper is one of the few that actually is beneficial for you, of course in certain amounts. I just want to point out that the higher concentration of copper in water, will not harm you over a short period. In fact, copper contributes to such processes as making new red blood cells or maintaining nerves and the immune system. It is even recommended to drink water from a copper mug to get that trace mineral into the water. Also, I am not sure whether it is true or not, but I have found it really interesting when I read it myself so I will share this with you. Apparently, copper has a very positive impact on people with natural red hair and makes it shiny and looking healthy. But you know, I have just found this information during research and didn’t get into too much detail as my blog is not about hair. If you have read my other blog posts, you probably know that even minerals that suppose to be healthy for you can be harmful when in excess. Now, copper is not different from other elements. The recommended daily usage is roughly 900 micrograms per day which is a tiny amount that we usually digest with a balanced diet so everything above that is not a necessity and can be potentially harmful. I don’t want to scare you, but the exposure to a high amount of copper can link with the following symptoms. Also, it’s suspected that excessive amount of copper is linked to the Alzheimer disease and long term exposure can damage the liver. If you want to read more in depth about copper and health you can do it here and here. You don’t have to worry unless it is huge exposure to copper, you should be fine if it’s just a short time. Now, let’s talk about how you can actually spot and test copper in water. When present in water, copper creates a greenish shade of water. If you have a white sink then just fill it with water, and you should be able to see the greenish color. Alternatively, you can do the same thing with the glass of water. You just need to visually check the water in a glass against a white background, and the color should appear. Water with copper can leave a metallic and bitter taste. However, this might not necessarily mean that this is caused by copper as other minerals can have similar impacts on taste. Also, if you have any appliances made of stainless steel, water that is contaminated with copper can create dark stains on the metal. If both tests haven’t revealed anything, you can use testing strip kit that can safely expose copper and other elements in water. Make sure to read more about ways to test water in my other article here where I go in more depth on the topic. You know that copper can impact your health and you have tested your water. If the test didn’t reveal any sign of copper than it’s excellent and you can stop reading here and go to read some of my other exciting articles like this one for example. If your results show that copper is present in water, don’t panic as now we will get it sorted. Without further ado, let’s do it. I am a big proponent of the prevention which means that I won’t be satisfied unless I know the cause of the event. So, before you actually go ahead and remove copper, I would suggest understanding where the copper is coming from. I think there is no need to point out that as a natural mineral, low amount of copper occurs naturally in water. Especially, if you have well as the source, you will have all sorts of minerals present in it. When it comes to city supply, water is usually tested for contaminants so its better. If you are using copper pipes, the chances are that most of the copper comes from them. This would be primarily a case if you have old plumbing that is corroding. The corrosion process releases copper particles into water, and this is a reason why you are reading this article. Beware, that not only old plumbing can cause the contamination, but the pressure inside pipes can pull copper as well. If old plumbing is the case, there is not much you can do with this rather than replace the corroding part or whole plumbing in your house. In that case, the plumber will help you out with this. If copper comes from the sources you have no control of, it is always better to protect yourself, so let’s have a look at what options you have. Unfortunately, copper is one of those elements that simply cannot be removed out of the water by boiling or sedimentation. In fact, if you decide to boil water, the situation will get even worse, because hot water dissolves copper more compared to cold water. So, unfortunately, the only way to help yourself is to invest in a water filter, but the question is which one is capable of doing it, and this is something I am going to have a look at, right now. The first and obvious choice that comes in mind is reverse osmosis unit. These are efficient units that remove over 95% of all contaminants and which includes copper as well. Now, the drawback of these is that the system is usually installed on the one single tap in the house. Well, unless you have tons of money to install a large RO system for the whole house. So, this could be the first option, but let’s dig deeper and see what other types can help you out. 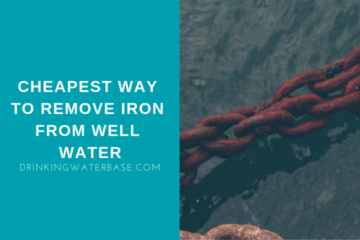 Some of the water softeners are capable of removing iron using the ion exchange method. But are they capable of removing copper as well as iron? Copper can be removed by ion exchange method as well. Essentially, this means that if you are using a salt based water softener with ion exchange resin, copper is removed to some extent. Although, the water softener is capable of removing copper, please beware that with the high concentration of the metal you might consider RO unit. Now, let’s find out about carbon type and whether it is capable of removing the unwanted element. I will keep it short and sweet in this section as the simple answer is yes! Carbon filters are capable of removing copper as well. The way it works is called adsorption, and it captures copper as well. Absorption is a process when molecules of one material, penetrate into another material and are absorbed by it. Adsorption, on the other hand, captures various molecules such as gas, liquid or solid which in our case is copper. Captured molecules are adhering on the surface together but cannot penetrate the adsorption material which in this case is carbon. Distillation is another great way of removing copper. In fact, distillation is a way of removing everything, but this is a big topic, and I think I will make a separate article about distillation. All you need to know for now is that distillation is an efficient way of removing copper as well. Sometimes copper could come only from the bathroom or shower tap. In that case, it would be a good idea to check if there is any old copper pipe in your house that can cause such inconvenience, and replace it. This would be a permanent solution, but in the meantime you can use carbon shower head filter. These are able to remove copper as well as other contaminants as explained earlier. AquaBliss filter uses a mix of KDF-55 and active carbon. In combination with a good price it makes a good candidate, so make sure to check it out – View On Amazon. You have reached to end of the article, which is great and I hope you have found plenty of useful information for yourself. Now, I would love you to share your experience with copper in water, in a comment section below. Any further tips I should include? Don’t forget to share the article on social media with your friends!